Lou Reed - Street Hassle. Vinyl LP. Bleep. 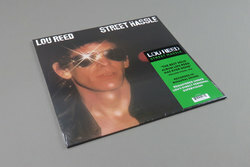 Street Hassle is the eighth solo studio album by American musician Lou Reed, released in February 1978 by Arista Records. Richard Robinson and Reed produced the album. It is the first commercially released pop album to employ binaural recording technology. Street Hassle combineslive concert tapes (with overdubs) and studio recordings. All of the songs on Street Hassle were written by Reed, including "Real Good Time Together", a track that dates back to his days as a member of the Velvet Underground.